The sources report gives you an in-depth look at which channels are generating traffic to your tracked websites. Sources attributes the source of a visitor, contact, or customer based on how they arrived at your website the first time they were tracked through a click or conversion. 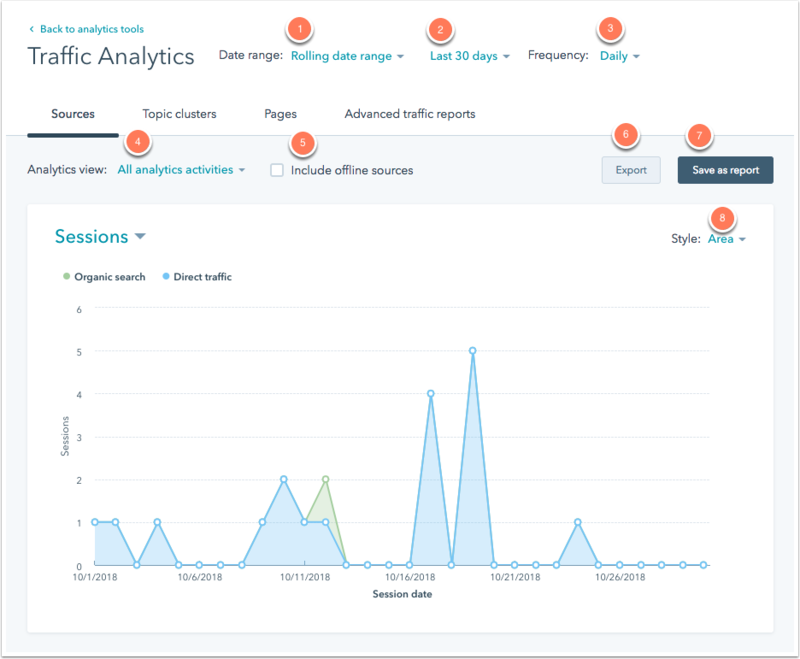 Click Traffic Analytics to open your sources report. Click the dropdown menu at the top to toggle between a data visualization chart of each metric. You can analyze metrics for activity on your website such as bounce rate, new sessions, and new contacts or customers. Organic search: visits from search engines. Social media: visits from social media sites. Email marketing: visits from email campaigns. Paid search: visits from pay-per-click ads. Paid social: visits from paid social ads campaigns. Direct traffic: visits from users reaching your site by directly typing in a URL. Other campaigns: an additional source that can be used for custom reporting when you implement tracking URLs. Offline Source: contacts and customers who originated outside of your website (manually added, imported, via API). Each source is labeled with a color bubble above your chart. You can hover over a specific point on the chart to see more details for each source. Below the chart is a table with a breakdown of each source. Select or deselect the Source checkbox to adjust which sources are included in the chart above. Learn how to drill down into each source to further analyze your data. On the sources report dashboard, you can customize your report by timeframe, frequency, and analytics view. By default, you'll see data for sessions this month to date for all of your tracked domains in HubSpot. Date range: choose a time period for your report. Default date ranges include last month, last quarter, last year. If you select a date range consisting of a week, the default starting day is Sunday. Timeframe: if you've selected Rolling date range, you can choose a timeframe from this dropdown menu. Frequency: select a frequency for your data to be segmented by. If you select Weekly, the default starting day is Sunday. Analytics views: filter by domains hosted on HubSpot and set as Primary in domain manager tool, or filter by a custom analytics view. Include offline sources: select this checkbox if you want to see analytics activity for contacts who were added to your HubSpot account through an offline source, such as API or import. Export: email a copy of your report to yourself or a member of your team. Save as report: add this report to your reports tool, where you can add it to a dashboard. Style: select to display your data in a bar chart or an area graph. 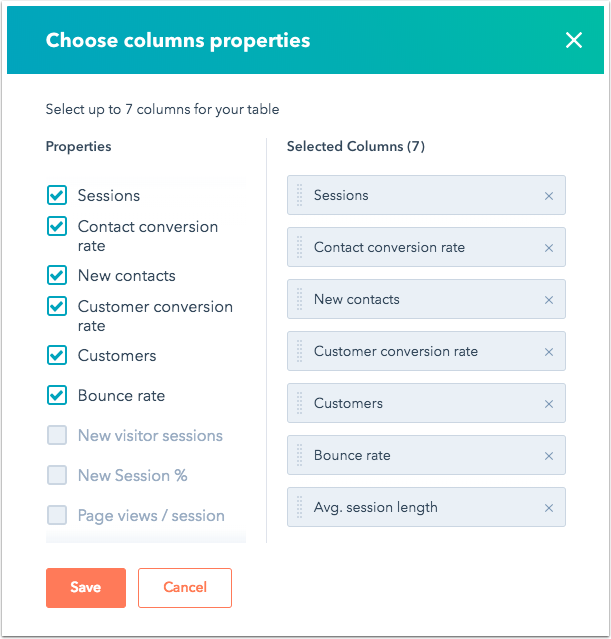 If you don't see the metrics you're looking for in the columns of the table below your chart, click Edit columns and select the Properties checkboxes for the metrics you want to see. The sources report can show up to seven sources at a time. To remove a source from your report, click the X next to any source under Selected Columns. You can change the source you're viewing trends for by selecting or deselecting the Source checkbox in the table. The scale of your chart will adjust to fit the size of the metrics. Marketing Hub Professional or Enterprise users can create analytics views for subdomains that are part of your account's brand domains. For groups of content and contacts, you can create custom analytics views to filter your data in the sources report. Users can create up to 25 custom views. Please note: if you've purchase a brand domain add-on, you can create 25 additional custom analytics views for any of your brand domains. Click the Analytics views dropdown menu. Select a view from the list or click Manage views. Hover over an existing view and click Edit to make any changes. To create a new view, click Add another view. Country: filters by the country of the visitor based on their IP address. Subdomain: filters by the subdomain of the page being viewed. You only need to include the subdomain of your target domain, such as www or blog. In the context of a session this will capture sessions that start on this subdomain. Brand domain (add-on users only): filters by one of your brand domains. Top-level domain: filters by the end of the domain that comes after the brand domain. In www.inbound.com, the top-level domain is com and in www.inbound.co.uk it's co.uk. URL path: filters by the URL path of the page being viewed. The URL path comes after the '/' in a page URL. Set your criteria then click Apply filter. Click And to add any additional properties, then click Save. In your sources report, click the Analytics view dropdown menu and select your view. Click the Analytics views tab. 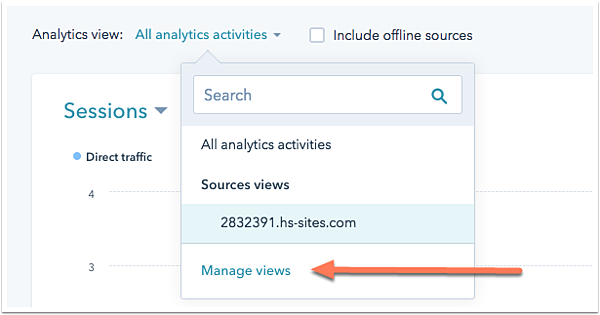 In the Custom Analytics Views section, hover over the name of the view and click Delete. To restore a deleted view, locate the view in the Recently deleted views section, then click Restore or Delete permanently. Views will be permanently deleted after 30 days.